The Rockies are all-in as contenders; is Nolan Arenado? The Colorado Rockies have a monumental offseason ahead of them with long-term ramifications as Nolan Arenado‘s contract situation continues to be a cloud looming over the franchise that needs resolution sooner than later. “I haven’t really thought about that. I expect to be in spring training with the Rockies next year,” Arenado told the media on Sunday night after being eliminated by the Milwaukee Brewers. Well Nolan, it’s time to think about it. Arenado’s comments on wanting to win and be a part of a consistent winner are well-documented, and the Rockies have undoubtedly been building one, evidenced by back-to-back postseason appearances. 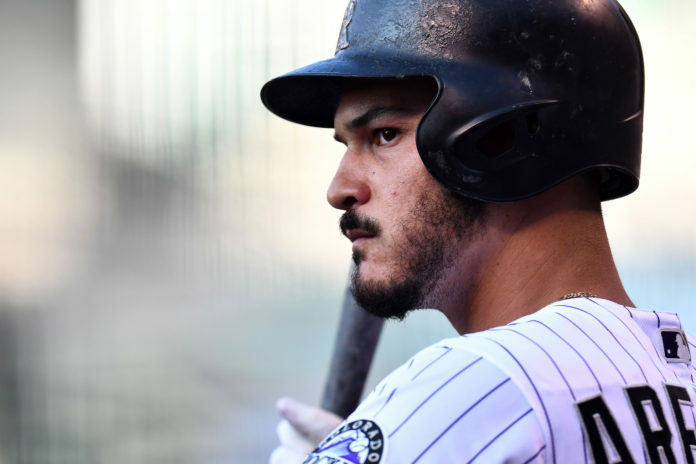 It’s time for Arenado to push his chips to the middle of the table – the Rockies have given him every reason to think they’re not bluffing about winning. From spending a record amount of money on the bullpen — $105 million, to be exact — to bringing back familiar faces and personal friends in Carlos Gonzalez, Colorado is fulfilling their end of the bargain, including handing big-money contracts to Wade Davis and Ian Desmond. Deadline moves in Jonathan Lucroy, Pat Neshek and Seung-hwan Oh over the last two years only solidify the notion that these aren’t your Daddy’s Rockies anymore. “This is a business; I know things can get a little weird when that side of stuff (comes up). Honestly, I expect to be here next year,” Arenado continued. While he expects to be in Colorado next year, the Rockies need some assurance from Arenado that this isn’t a short-term relationship. They need to know that they can parlay Arenado’s desire to stay long-term and utilize that information in future moves to better the team, making them more competitive in time, which only feeds into Arenado’s wishes. The Rockies have done everything possible to build a competitor, not only for the now, but for the future, and their foundation is strong. 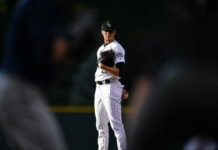 From the growth of young aces Kyle Freeland and German Marquez to the abundance of talent that Colorado holds with Ryan McMahon, Garrett Hampson, Raimel Tapia, the Rockies are young and talented. And don’t forget about Brendan Rodgers, the MLB’s ninth-ranked prospect in the all of the minor leagues, still waiting in the wings. Colorado is loaded with ammo for long-term success, but Arenado’s contract situation is a serious road block that could hold up momentum if not dealt with sooner than later. How much more does Colorado have to show Arenado that they’re for real — as a serious contending team – before they’ll eventually come to realize that he just wasn’t going to sign here regardless? It’s time for Colorado to discuss a long-term contract with Arenado and inform him that he needs to sign on the line and embrace the rise of the Rockies, or force Colorado into doing something they surely don’t want to do: trade him. Arenado’s trade value would be absurd; a potential haul that Colorado would be foolish not to investigate if Arenado won’t sign long-term. Eliminating the idea of a trade wouldn’t be smart business – it must be explored, even with their their beloved superstar, if he won’t commit. 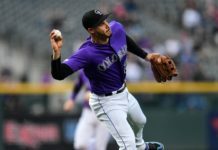 Arenado has the opportunity to do something very rare in all of sports – not only could he become a Hall-of-Fame talent and spend his entire career in one city, but he could become a sports icon in the Rocky Mountain region. Like John Elway is to Denver, Arenado has the opportunity join him on the Denver sports Mount Rushmore. It’s easy to envision Arenado as the greatest Rockie ever, maybe with a ring at the end of the day, too. Colorado’s fulfilled their end of the bargain so far. It’s time for Nolan to follow suit. A smooth and easy contract resolution leads to an easier-to-execute offseason, injecting incredible excitement into a Rockies fanbase that surely will sell out Coors Field by the bunches next year. So whaddaya say, Nolan? Rocktober for the next ten years at Coors Field?